Million Dollar Mike Morgan is a top copywriter currently working for a major division of the world’s largest financial publisher, Agora Inc. As a copywriter for Agora’s Money Map Press division, Mike’s in charge of promoting newsletters and other financial advisory services. His promotions that have made as much as $17 million apiece. Mike doesn’t like to do many interviews, but he’s one of my closest personal friends and so I was able to convince him to share some valuable inside secrets with you about what it’s really like to write for the big guys. Mike’s also one of my copywriting mentoring clients and I couldn’t prouder of him. And, he’s a Gary Halbert All-Star, one of a handful of top copywriters who Bond and Kevin Halbert invited to read and comment on one of Gary’s letters for their special audio series. 1. So tell us how you got here. Everyone’s path to the top is different, and I know for a fact yours is interesting! 2. It seems like everyone I talk to wants to write for Agora. Give us some highlights about what it’s like, and how it’s different from how you thought it would be. 3. What’s the biggest difference, for you, between writing sales copy for an Internet info entrepreneur and writing copy for a big financial publisher? 4. OK, so, not many people know this about you, but you’re a coach and teacher yourself. At least in a past life. You’ve coached copywriters and you even coached an Olympic cycling team at USC. These days you put 100% of your time into copywriting. But putting on your coach hat for just a minute, what advice would you give someone who wants to eventually become a copywriter for the big publishers? 5. I rarely talk about this on the podcast, but you and I have talked about this a lot personally, so I thought I could broach the subject here. It seems that sometimes copywriters don’t have the best people skills, which is something you’re really good at yourself. Could you talk about what difference that makes, especially in the big-time? 6. 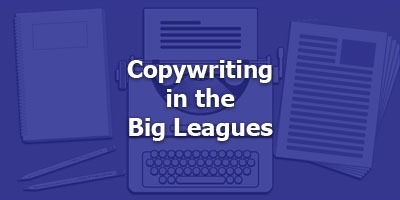 Finally, I’d like to ask you for one or two really great tips for a copywriting career nobody talks about, but you wish you’d known yourself way back when. What would those be?